My Home and Garden: Dinter Nursery...I cannot get out without buying something!! Dinter Nursery...I cannot get out without buying something!! Allan and I recently went to Gabriola Island. If you haven't been there, it is really worth the trip. Beautiful. On our way home we pass through Duncan. Just south of Duncan...Dinter Nursery. I always stop there. I got a beautiful pink and a purple phlox. I am always looking for pretty plants for the bees. 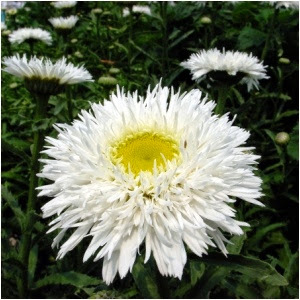 I have been looking for a heavily fringed Shasta Daisy. They only had a couple, but now I have it. I'm usually quite a purist with my plant choices, but this is a Daisy I cannot resist.